When Portugal decided to double-down on colonizing Brazil, it based this decision on some wishful thinking: that Brazil carried precious metals just like Peru and Mexico did. Brazil was first “discovered” when a squad of Portuguese ships found its land when navigating east from Portugal in the hopes of finding an alternative route to the Indies, where it could buy stuff like cinnamon and pepper to resell back home. Unfortunately for Portugal, there wasn’t a lot of gold or silver around here. So in the first few years of the “discovery” (16th century), Portuguese settlers explored native indians to extract Pau-Brazil from the jungle. The trade was terrible, since the noble wood was very difficult to transport back to Europe. Next came sugar cane agriculture. Brazil had lots and lots of land to spare, so Portugal divided its territory into many lots, and these guys who received the lots had the explicit contract to spread Portugal’s influence and defend the land from other contenders. Large-scale agriculture was perfectly suited for the job. It took huge swaths of land and its main product, cane, could be turned into sugar, an expensive product in European markets. Native south-americans (whom we call indians), weren’t, nonetheless, as “suitable” for the job. They couldn’t take the intensity of the job at hand and were perceived by farm-owners as “lazy” by not complying with their orders. 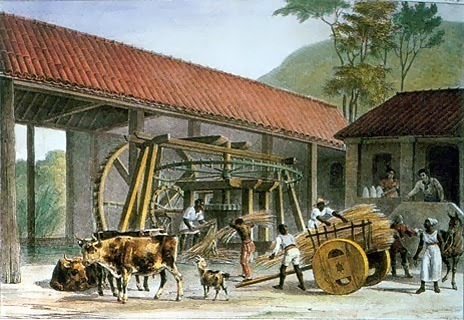 Shortly, Brazilians and Portuguese started trading heavily on African slaves, and that really fuelled the expansion of sugar cane Agriculture. But the “green gold” rush wouldn’t last long: by the 17th century, other European countries like Holland and France had colonized Central America and set up what arguably was a much better sugar-cane production operation on those lands. The over-supply slammed down sugar prices, and the Brazilian producers went basically under. 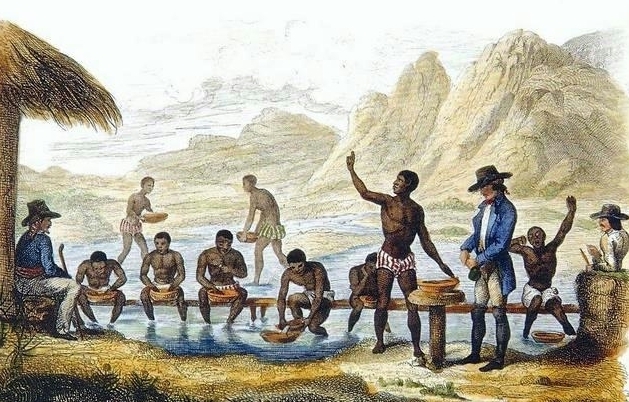 At the same time, Brazilian explorers, called “Bandeirantes”, found evidence of gold on the basin of inland rivers, on a region that later became the Minas Gerais state (North of São Paulo, Northwest of Rio de Janeiro), and then and there started Brazil’s own gold rush. This tropical gold rush changed Brazil in several ways. First of all, Portugal had an economic revival with Gold taxes applied in Brazil. That was much needed after the sugar cane drought. Second, the Gold Rush spurred a first wave of massive migration that eased geopolitical threats from Holland and France (Holland had briefly tried to conquer a swath of land in Brazil’s Northeaster region, where Recife-Pernambuco is today). But the most impactful effect it had was in generating social mobility. In contrast with the Peruvian and Mexian mines, Brazil’s extraction of gold required very little capital. On it’s extreme, it could be done by a single person who, if lucky, could find some gold nuggets and start a little enterprise with a small number of slaves.